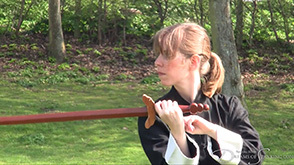 A martial arts student chooses to undergo a final inurement practice before embarking on a journey. Enduring a full force 50 stroke cold caning, she discovers that pain is not an enemy to be feared. Molly gets back from the gym and confesses she tried to lift too heavy a weight and had to do a "roll of shame". Her housemate Pandora leaps at the chance to give her a disciplinary spanking!